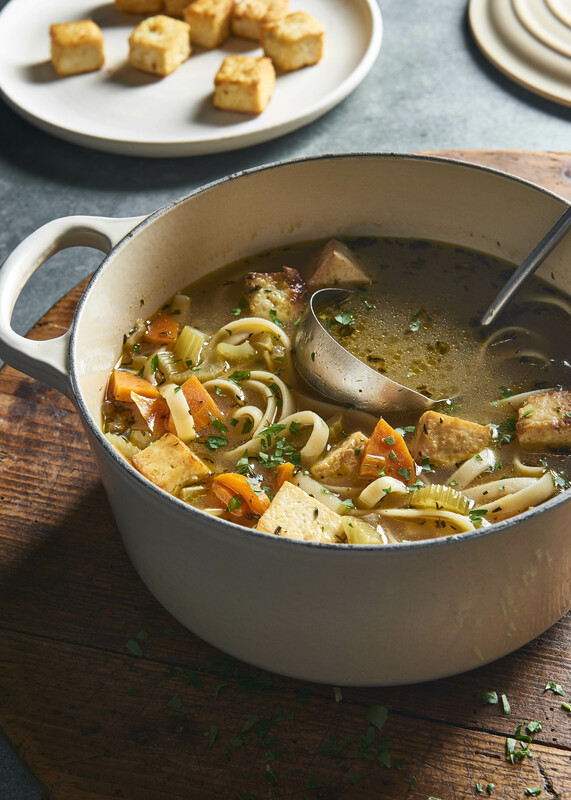 A “chicken” noodle soup that’s perfect for a vegan soul, this deliciously warm, gluten-free recipe by The Blender Girl is the dish to curl up with this winter. Wrap the tofu in paper towel, and pat dry until all of the excess moisture has been removed. Wrap in a dry piece of paper towel, and allow to sit. In a saucepan, cook the pasta according to the manufacturer’s instructions. Drain, and set aside. Unwrap the tofu, and cut the block into equal 1-inch cubes. In a bowl, combine 2 tablespoons of the olive oil with 1 1/2 tablespoons of the chicken-flavored powder, garlic powder, and onion powder, and stir until well combined. Toss the tofu cubes in the oil mixture until evenly coated. In a large skillet over medium heat, sauté the tofu cubes for about 10 minutes until lightly browned, turning when needed. In a large stockpot over medium heat, warm the remaining 2 tablespoons olive oil, and sauté the onions, garlic, thyme, celery, and carrots for about 5 minutes, until the onions are soft and translucent, and the celery and carrots are softened, but not browned. Pour in the broth and the remaining 1/2 tablespoon of the seasoning powder, and bring to a boil. Reduce the heat to medium, and simmer for about 5 minutes, until the carrot is just tender. Stir in the lemon juice, tamari, and parsley, add the cooked noodles and tofu, and season with pepper to taste. Serve topped with a sprinkle of additional chopped parsley.